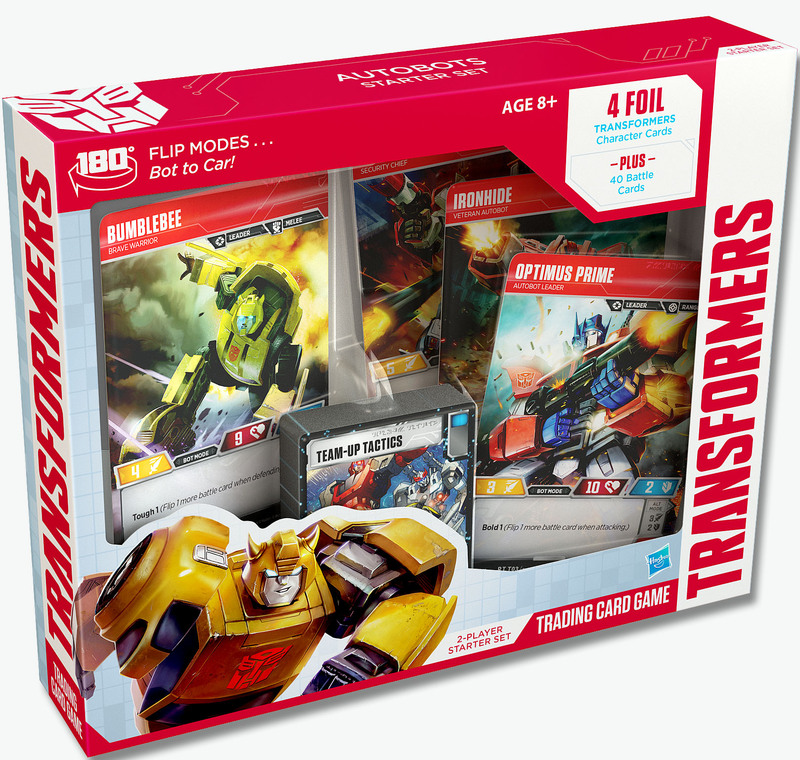 [WATCH] Roll out for the new Transformers Trading Card Game – AiPT! The trading card game landscape is and pretty much always has been dominated by the Big 3: Magic, Yu-Gi-Oh! and Pokémon. It’s no wonder — they were all there at the start and continually change (just enough) to keep people coming back, year after year. Now Wizards of the Coast (yes the makers of Magic: The Gathering) are producing a new game with a very early TCG feel, the Transformers Trading Card Game. Can it survive in an already crowded market? The gameplay, as we discovered in the samples Hasbro gave us, isn’t really exceptional, other than the ability for your Transformers to switch between Bot and “Alt” mode. This might actually be a unique mechanic thus far, and allows for some automatic engine-building, before the first cards are even flipped. Yes, like Raw Deal or Upper Deck’s stillborn Super Hero Squad, you flip cards when attacked, but also to attack. Each character has attack and defense values, and both the attacker and defender flip two cards from the top of their decks to add to those values (orange icons at the tops of cards give more attack, blue more defense). So there’s an added wrinkle in deckbuilding — not only do you want to load up on cards that interact well, you need to make sure you balance those icons, so you don’t get in a position where you can’t defend yourself, or your attacks never land. There are lots of different modifiers on the Transformers, like “Leader,” and attack styles like “Range” and “Melee.” You can also identify bots based on what kinds of vehicles they are, or as Insecticons, Dinobots, etc. Certain cards will key off these characteristics for bonuses. One of the best things about the Transformers TCG is that you don’t have to have the same number of characters every game. It’s based on how many stars are at the bottom of a card — you get as many as 25 total, and while the biggest guys available in boosters might scrape that threshold themselves, all the ones in the starter deck come in under 10. Each booster pack comes with seven “battle cards” (comprised of upgrades and actions) and one oversized Transformer card, and retails for $3.99. The Autobots starter set (why isn’t there a Decepticons starter set?!) goes for $14.99. The Transformers Trading Card Game isn’t going to revolutionize TCGs, but it does have some interesting mechanics mixed in with the more prosaic ones. To be quite blunt, it likely won’t make much of a dent in the market, but the theme, simplicity, and breadth of cards and characters available will be enough to entertain the young or young at heart for a few afternoons.